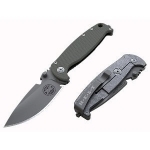 Typical of Chris Reeve Knives, the pivot strength is more robust than other folders. The large pivot screw and pin are supported by large thrust washers. These perforated phosphor bronze washers reduce friction and double to retain the fluorinated grease for longer lubrication thereby extending the life of the knife. The thumb lug doubles as the stop pin, ensuring a solid lockup. Around the lug is a polyurethane o-ring that acts as a shock absorber to cushion the impact of the lug against the handle. Never wishing to copy other designs without giving credit, Grant and Gavin Hawk originated the shock absorber concept in one of their many innovative designs. After doing my testing on the Umnumzaan I have nothing but good things to say about it. It was the sharpest knife out of the box I have ever seen. Semi convex edge bevel that was semi polished and around 40 degrees inclusive. The blade grind was very consistent within .001" all along the edge and that makes for a very even easy to sharpen edge. The knife handles very nice even during hard cutting tasks. The thin hollow grind and blade design works extremely well. The overall knife design is excellent and ment to be used. You will need to buy the toolkit and grease if you want to keep the knife clean. Take down is easy as is putting it back together due to the very tight tolerances. I have one of the Tanto bladed Umunmzaan's, and feel pretty luckky about it. I traded my Sebenza for it, and got the better part of the deal. The fit and finish of the knife is impeccable, as it should be. It is not a cheap knife, but it will always hold its value because of the CRK spa and guarantee, which will return the knife to as new condition for a small fee (I think it is 30.00). The knife places the thumbstud in a slightly different place than most knives. It is placed more forward, and took some getting used to. The cushioned studs impact the fram, creating a tremendously strong lock-up. I hate to think what it would take to break one. One of the more controversial changes probably was the grooves machined into the front part of the frame sides, but this gives the knife a great grip. I gave it a 9 only because I think the Strider SMF feels better in more positions. The Umnumzaan does have a large swelling at the front that should keep your hand from ssliding forward, but it is not as secure a thusting knife as a Strider. The Tanto blade is razor sharp. Yeah yeah, everyone says that, but I shave my head with mine. I like the blade profile (it comes convexed, my preferred edge) and even the front slant of the tanto edge is hair-popping sharp. The new perforated bushings do a great job of making the blade easy and smooth to operate. The framelock operates perfectly each time, with that ceramic ball working its stop-magic each time. The locking bar is upswept where your thumb comes across to unlock the knife, making that task a bit easier. I've never used the glass-breaker, but it would also make a great skull-buster, making the knife a good weapon even closed. I've had the knife a little over a year, and it is built to last a lifetime. I have owned my Umnumzaan for over a year and it has never once ceased to amaze me. The source of the power is the locking style and lock bar face. These lock-up with the thunbstuds contacting the frame. The lock bar face has a ceramic ball that contacts the blade tang. This preserves the lock-up since there is never steel-on-steel contact. This knife is smooth like butter to open and close. The lock bar never sticks. The handle is great with the checkering. Blade shape with the semi-sharp Swedge at the tip is useful as a fire striker when needed. The blade when closed also has a small glass breaker. Overall this knife is worth every penny. It just has a big sticker shock at first. Got an Umnumzaan & it ended up replacing my large Classic CGG Sebenza, which I didn't think would ever happen. 1st impression of the knife is that it's top quality, just like the Sebenzas (I've had 6 different ones). It feels great in the hand, is light for its size & just feels "right." Upon opening/closing it, the 1st thing I noticed is that it seems silent & so smooth. The blade shape should make any "tacticool" fan happy & the design on the Ti scales are just right for grip. I had to have a G-10 scale made for my lg. Seb to make me happy. The Umnum doesn't need anything, IMHO. The biggest problem with the knife is that it pretty much makes you not want to carry any other similar size folder. At 1st glance, they seem expensive, but you can get them on the secondary market & considering that you probably won't need another folder, it'll save you $ in the long run.